I neglect this cooking blog horribly. More so than my other blogs. On this cold winter day I am reminded of warmer days. Happier days. 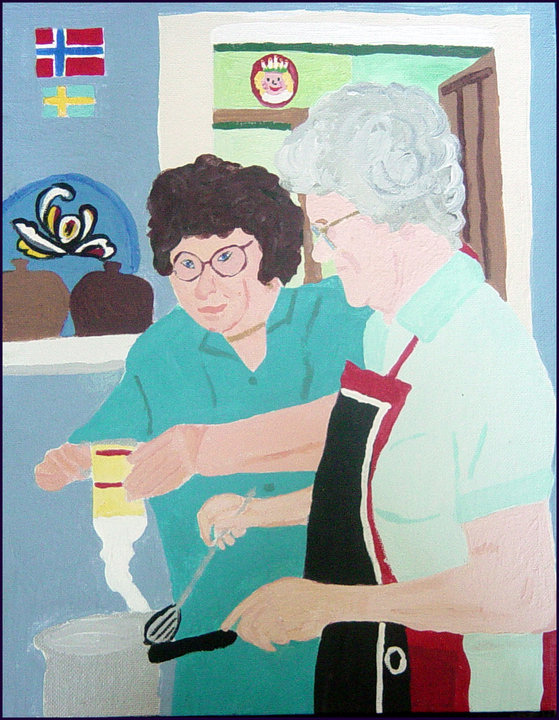 I remember my mother and Hilda, a friend who lived to be 100, cooking rømmegrøt in the kitchen. Hilda also made rømmebrød, which looked like pie crust but tasted heavenly. She also made julekage. My mother didn’t make as many of the traditional Norwegian dishes but she did make some nameless Swedish puddings that she had learned from her grandmother. Also she had a fondness for limpa (Swedish rye bread), and she made jelly roll and oatmeal bars out of Saskatoon blueberries. When we held a hospice festival here on the farm, I set up a little Scandinavian bakery in the summer kitchen. We were going to sell treats like krumkake, lefse, the above-mentioned rømmebrød, and an aunt who isn’t even Scandinavian made a delicious Swedish flatbread with anise that she had researched. The neighbor who was a star attraction with her lefse refused to sit in the summer kitchen (not enough air in there). I had to set her up under a canopy outdoors so that knocked my Scandinavian bakery idea in the head. I also remember Hilda told me she had never made waffles. So I loaned her my waffle maker. She had me over for her waffles, which were kind of heavy, and confessed it wasn’t really her thing, and if I wanted the waffle maker back, I knew where it was. I never did go get it. I’m sure it’s still in her house. Waffle making isn’t my specialty either.